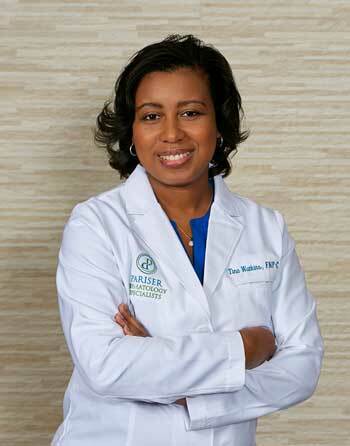 Tina Watkins is a board-certified family nurse practitioner specializing in dermatology. She enjoys providing compassionate care to individuals with general dermatology concerns. Tina is proud to be an active contributor toward the advancement of medicine and has over 10 years of clinical research experience. She has helped to conduct over 100 clinical trials for a multitude of skin conditions including psoriasis, atopic dermatitis, and acne. A native of Virginia Beach, Tina enjoys traveling with her family, cooking, dancing, and discovering new hobbies. "I love the Pariser Dermatology staff. They're all very kind, compassionate, understanding and professional." "I was so happy with my visit. Tina was kind, professional and addressed all of my needs." "I have been a patient of Pariser's for over 20 years. I have always received excellent care and service from all of the personnel. Tina Watkins and her staff are very understanding and attuned to my needs." "PA Tina is the best!"